Susan Sturman has been in the hospitality and special events field since 1981. A caterer for years in Boston, she has experience in virtually every aspect of party planning and execution. In 1992, she moved to Paris, France, to study classical French cuisine and pastry at the Ritz-Escoffier Ecole de Gastronomie Française, the prestigious cooking school at the famed Paris Ritz. She subsequently served as Assistant Director of the school for two and a half years. After leaving the Ritz, she founded epicurean catering, offering gourmet food prepared onsite for private and corporate clients in and around Paris. Repatriating to New York after six years in Paris, in 1992 she began offering custom designed, hands on cooking classes in clients’ homes. While at the Ritz, Susan developed a love for French cheeses. She taught the cheese classes at the Ritz for over two years. In New York, her classes have been offered at Murray’s Cheese and Sur la Table, as well as for corporate and private clients. She has served as Marketing and Development consultant for the New York State Farmstead & Artisanal Cheese Makers’ Guild, and is a member of the American Cheese Society and Slow Food USA. Susan serves as Chair of the American Cheese Society’s Education Committee, which is developing a national certification program for cheese professionals. In addition, she has organized a number of panels and presentations at ACS national conferences. 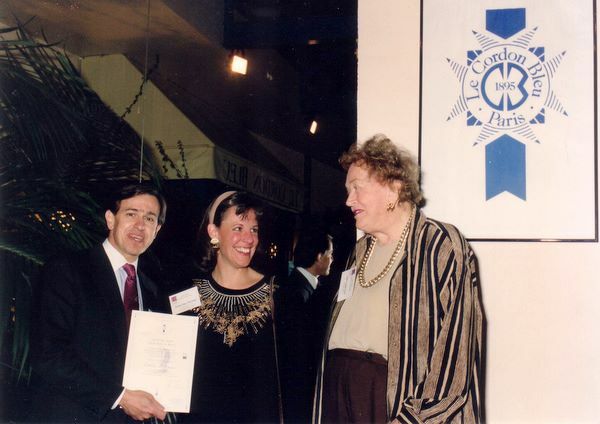 Sue receiving an honorary Cordon Bleu certificate in Paris in 1995 from Andre Cointreau, owner of Le Cordon Bleu, with Julia Child. "I have had the great pleasure of working with Susan Sturman on the Fromager Certification Project for a number of years. What has impressed me most about her efforts with our committee has been her determination to see that the project be handled professionally, all the while maintaining a respectful and welcoming management style. Susan has kept the process moving along, even when faced with seemingly insurmountable obstacles and roadblocks. She has kept a positive attitude throughout, keeping the committee's focus on the goals of its mission statement. This project will be rewarded ultimately with her own standards of quality and her leadership. And above all of this, Susan is a joy to be around." "Bold, sharp, and intensely intelligent, this spicy instructor is not for the timid! Susan is raw, bluntly honest, and can sometimes be downright craggy. But beneath that strong rind lies a core that's pure caramelly sweetness with a velvety rich commitment to true hospitality. Her complex and well-rounded knowledge base developed through a traditional process that combined both formal education and real-world work experience--the first lends structure, the second a definite earthy quality (no dirty-hands phobia here!). After earning a degree in Public Relations from Boston University, Sue was inoculated with culinary skills at the Ecole Gastronomie Française Ritz-Escoffier in Paris. Her professional talents solidified with catering stints (four years working in Boston, then owning her own company in Paris) and two and a half years as Assistant Director at her alma mater the Ecole Ritz-Escoffier. Ripe, mature, and with a yeasty eagerness, Sue opened Epicurean in 2002 which offers custom-designed cooking classes for small groups in their own homes. This vibrantly dedicated foodie is also a member of the Cheese Education Coalition as well as Slow Food's American Cheese Society. Sue's widespread gastronomic know-how makes her a versatile choice."